Just Temptations is a Canadian Company led by a dynamic team whose service and dedication is second to none. We strive to make all of life’s special occasions unforgettable and create desserts that offer a feast for the eyes and the taste buds. 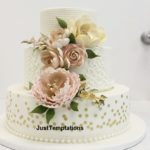 Just Temptations uses only the finest and freshest ingredients to make divine and beautiful Wedding Cakes and Desserts in the Greater Toronto Area. Our wide assortment of scrumptious flavours is sure to tempt any taste buds. Many couples in Toronto are choosing to go with more adventurous designs and flavours for their Wedding Cake. We offer Wedding Cakes in any combination of style, colour and flavour that will be perfect for your Toronto and Greater Toronto Area (GTA) wedding. 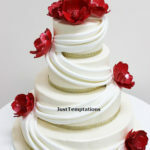 We specialize in Custom Wedding Cakes but also offer Traditional Wedding Cakes, Contemporary Wedding Cakes, Cupcake Wedding Cakes, Simple Wedding Cakes, Fondant Wedding Cakes, Butter Cream Wedding Cakes, Chocolate Fondant Wedding Cake, White Chocolate Fondant Wedding Cakes, Chocolate Ganache Wedding Cakes, White Chocolate Cigar Wedding Cakes, Seashell Wedding Cakes, Sugar Flower Wedding Cakes, Wedding Cakes with Fresh Flowers, Multi-coloured Wedding Cakes and Wedding Cookies. Any unique Wedding Cake design that you can imagine, the Chefs at Just Temptations can create. Just Temptations opened in 2003 in Mississauga, just minutes from Toronto. Our award winning Master Pastry Chef, and owner, brings with him a world of experience having worked in the Middle East, Asia, Europe and the United States before coming to Toronto. He continued his career in Toronto in 1999 at Cake Art in Toronto, Enville Catering in Toronto and the Sheraton Centre Hotel in downtown Toronto as an Executive Pastry Chef, where he was able to enhance his skills in Wedding Cake design. With his masterful direction and creative genius, the Chef creates some of the most creative and delicious Wedding Cakes in Toronto. Just Temptations lends new meaning to creativity and taste in the world of Wedding Cakes in Toronto. 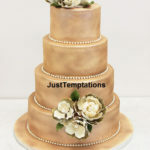 Located just minutes from Toronto, Just Temptations services and delivers Wedding Cakes to all areas of the GTA including Mississauga, Brampton, Scarborough, North York, Etobicoke, Woodbridge, Vaughan, Maple, Concord, Markham, Richmond Hill, Thornhill, Hamilton, Ancaster, St. Catherine's, Stoney Creek, Brantford, Grimsby, Burlington, Oakville, Caledon, Orangeville, Kleinburg, Ajax, Whitby, Oshawa, Pickering, Stouffville, Port Perry, Guelph, Halton Hills (Milton), Campbellville, New Market, Uxbridge, Kitchener, Waterloo, Cambridge, Bond Head, Aurora, King City, Kettleby, Alliston, Barrie, Niagara-On-The-Lake and Niagara Falls. We can also make cakes or cupcakes for any special occasion including an Anniversary cake, Birthday cake, Baptism cake, Christening cake, Communion cake, Confirmation cake, Graduation cake, Bridal Shower cake, Bachelor or Bachelorette cake, Baby Shower cake, Reunion cake, Holiday cake and Corporate Event cakes Chocolate Fountains and Sweet Tables are also available. Copyright © 2018 Just Temptations. All Rights Reserved. Website Design & SEO by Wiretree.